Our handmade folding canvas chairs are perfect for al fresco dining, camping trips or summer festivals. Personalised with your photos or original designs, they are totally unique to you. Pack your wooden folding stools into the car ready for impromptu picnics or days at the beach. Portable & weatherproof, use them all year round. Nobody likes a soggy or sandy bottom, so customise your own folding canvas chairs exactly how you want them. The personalised wooden stool is a great idea for any number of uses. From events to day trips, this stool is comfortable as well as portable and you can easily pack it away into the car, ready to whip out at a moment's notice. I'm a returning customer who was delighted with the double deckchair, with a photo I had taken printed onto it, resulting in vivid colours and clarity I wasn't expecting to be so good. For a friend's 50th, I ordered two folding chairs each with individualised photos with his name overlaid onto them. They arrived in perfect condition in under 4 days. The birthday boy was blown away by his present, as were his other guests. It's highly likely BagsofLove will get more business from this group of friends! Turnaround impressive. Effective packaging. Product quality Excellent. Print quality excellent. Surpassed my product expectations and I can't think of any improvements! Will definitely remember you! 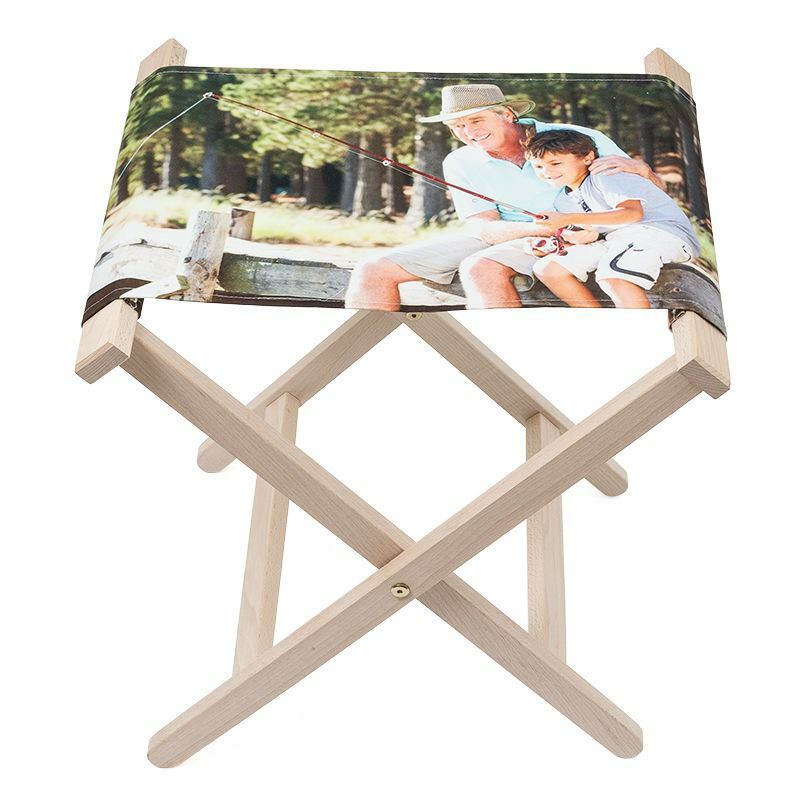 I have recently received a folding stool chair and a photo blanket from you and am very impressed by the quality and speed of delivery! Thanks and I hope that next time I come - which will be very soon! - it works so well again. Think I saw you a few years ago and have used you ever since. You are the only people I recommend when buying canvases - or any gifts! Like many of our products, the canvas folding chair comes with a quantity discount, so get a set for the garden table or next camping trip and save money today. Guarantee: covers the strength and durability of the canvas and the build structure of the wooden frame. Thanks to our specialist printing process that binds the ink to the fabric, your design won't rub off or peel away. However, if left out in the garden all summer exposed to daylight, the print might naturally fade. Keep covered in the summer or fold away into your shed/garage for long-lasting print results. Handmade to order in London, UK, your personalised wooden stool has many uses, including last-minute unexpected dinner guests. Made using responsibly sourced wood and thick, strong canvas, these weatherproof chairs are perfect all year round come rain or shine. Care: the canvas seat is fixed to the stool so cannot be removed to machine wash. Wipe clean with a cloth after use to maintain quality. For tougher stains and dirt, use a warm soapy sponge and leave to dry unfolded. The canvas seat area of your wooden folding stools is landscape, so choose wider images over portrait ones for best results. You can also create a bold photo collage using our design system. Simply select several images and choose your montage style. As a gift to your outdooring loving partner, go for the romantic heart-shaped montage with a complementary background colour. For a lads camping stag do, personalised camping chairs printed with nicknames and funny photos is a memorable way to send off the groom-to-be into married life. Design a special one for the stag, so your neighbouring campers know who the lucky man is. It's not wristbands that symbolise summer festivals. Custom folding chairs printed with the weekend dates and photos of the headlining performers makes super chic festival style and a unique memento. Perfect if you have a stall at a craft show, car boot sale or exhibition event. You can amplify your promotion and company branding and because it's not generic, nobody is going to 'borrow' your branded chair. Get comfy on the floor: design your own round floor cushion. Available in 2 sizes.